Academic blogs can be used by professors in many different ways depending on their subject matter, lessons, and pedagogical goals. To guide you in the decision of what approach will be best for you to achieve your pedagogical goals we have created the series 3 ways to Edublog. In this series we will feature 3 distinct pedagogical and technical ways to use your blogs as educational tools in your classroom. 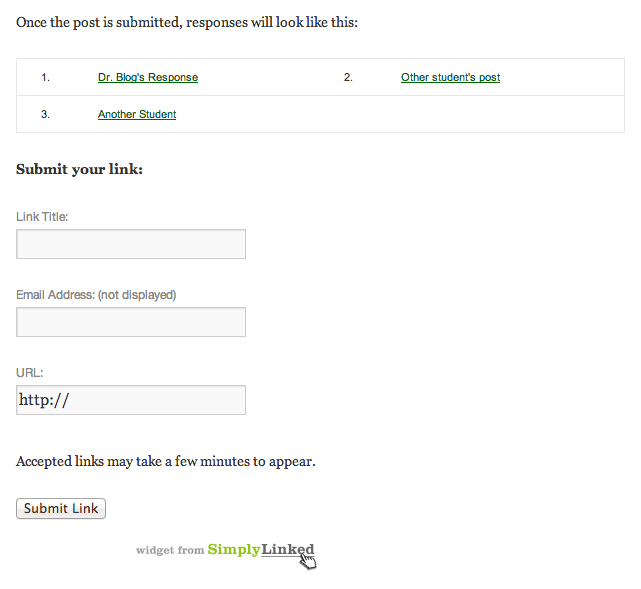 LinkUp blogging is when students can submit specific blog posts to a professor’s post with the use of a LinkUp tool. This particular way of blogging works best for situations where a professor wants students to write a response about a prompt/scenario. Note: It is possible that after pasting the code in html mode you won’t see it upon returning to visual mode. To make sure your linkup works properly finish your blog post, paste the code in html mode, and publish it right away (from html mode). There are particular benefits for using this approach. If some of your students already have wordpress blogs as public platforms or as professional portfolios and if you would like for them to be able to continue owning, managing, and customizing their own blogging environments this is a great approach. Also, this approach may encourage them to blog and reflect about other issues that are not directly related to your class that could be helpful in their development as a student and creative thinker. This approach gives teachers direct access to students’ blog posts about the prompt and other students have direct access to their peers’ blog posts. Blogs offer students and faculty great opportunities for interaction with each other. Commenting on each other’s blog posts is a great tool for reflection and understanding of peoples views on particular issues and classroom content. WordPress blogs allow for customization of blogs with the use of widgets and some of the widgets show recent comments. This capability is very helpful to aggregate and show blog comments from an edublog classroom has many students. With LinkUps, this is not possible. Comments only show on the original posts, in the original hosted blog. If you want to know more about blogs click HERE. 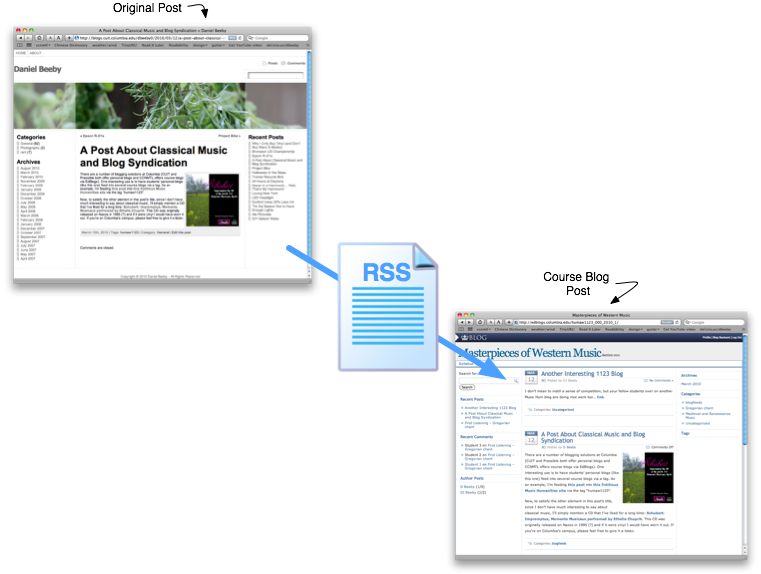 Whenever a student creates a wordpress blog, a RSS feed address is assigned to that site. 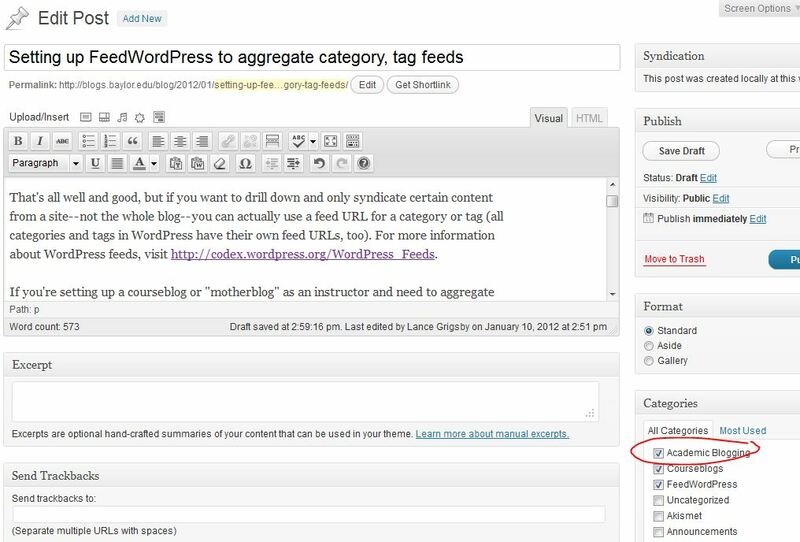 By activating the FeedWordPress plugin and configuring it to fetch the posts from the students’ site with their RSS feed address you can bring all of their posts, or select posts with a particular tag or category to a class website. There are particular benefits for using this approach. If some of your students already have wordpress blogs as public platforms or as professional portfolios and if you would like for them to be able to continue owning, managing, and customizing their own blogging environments this is the best approach. Also, this approach may encourage them to blog and reflect about other issues that are not directly related to your class that could be helpful in their development as a student and creative thinker. Blogs offer students and faculty great opportunities for interaction with each other. Commenting on each other’s blog posts is a great tool for reflection and understanding of peoples views on particular issues and classroom content. WordPress blogs allow for customization of blogs with the use of widgets and some of the widgets show recent comments. This capability is very helpful to aggregate and show blog comments from an edublog classroom has many students. With FeedWordPress, so far, this is not possible. Comments only show on the original posts, in the original hosted blog. For instructions on how to setup FeedWordPress click HERE. If a student blog feed doesn’t syndicate you should read THIS. If you want to know more about blogs click HERE. 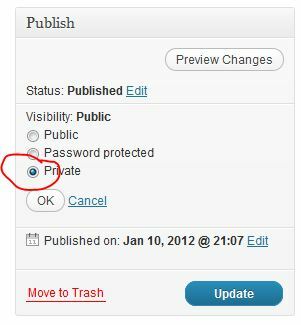 This particular error often means that the blog you are attempting to syndicate has privacy settings enabled. Unfortunately, the breed of motherblog that relies on remote syndication of content will not work if the sites it is attempting to syndicate are not fully open to the web. In any case, if you experience this error–or others like it–visit with your students to 1). ask whether they have privacy controls enabled or 2). whether they’ve just categorized something incorrectly (in order for category feed URLs to sync properly, the remote bloggers must be categorizing their posts properly). If your students are electing to blog privately, please see our recommendations for managing privacy in courseblogs. There are ways to have a fully open courseblog and still let individual students contribute private posts that are only visible to the blog admin. 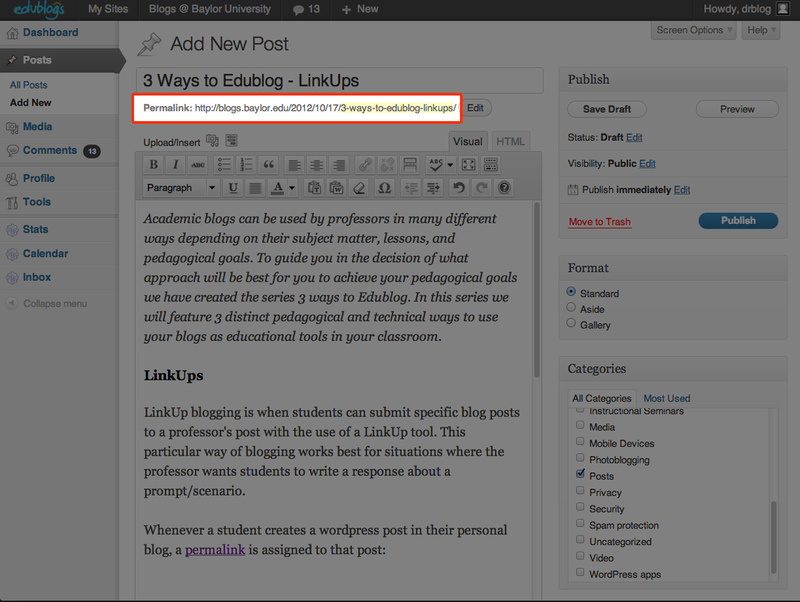 Scenario: You’re an instructor using the FeedWordPress plugin to aggregate your student blogs into your courseblog. You enjoy the convenience of being able to read all your students’ posts on one site, as opposed to having to visit each of their sites individually to make sure they’re on task. But what if one or more students insists on having private blogs? Sure, they could add you to their site and give you permission to read their content, but that requires you, the instructor, to keep up with more than one site. And what if that student wants to delete their content from the blog after the class is over? The main problem is that blogs that are restricted from public view will not have usable feed URLs, which means private blog feeds can’t be aggregated into a courseblog. However, there is an easy solution for maintaining a courseblog with a mixture of private and public posts that allows the instructor to see all the content on one site. In addition, this alternative approach to courseblogging gives students full control over their content once the course is over–once added to a courseblog as an author, a student can write public or private posts and then, at the end of the course, remove those posts or export them elsewhere. Here’s how it works: All students who want private blog posts should be added to the courseblog as Authors (learn more about roles in WordPress). To add these users to the site, click Users > Add New and fill out the Add Existing User field with the username/email of your choice, making sure to give that user the correct role. In this case, the Author role is a good choice since it will allow that student to control the visibility of their posts on the courseblog. Once these posts are marked private, only the administrators of the courseblog (presumably, this is only going to be the instructor of the course) will be able to see those posts. The only other requirement is that the blog admin must be logged into Edublogs to see the private posts. That’s all well and good, but if you want to drill down and only syndicate certain content from a site–not the whole blog–you can actually use a feed URL for a category or tag (all categories and tags in WordPress have their own feed URLs, too). For more information about WordPress feeds, visit http://codex.wordpress.org/WordPress_Feeds. If you’re setting up a courseblog or “motherblog” as an instructor and need to aggregate multiple feeds from other WordPress sites using the FeedWordPress plugin, the first thing you’ll want to do is have your student bloggers create a category or tag specifically for their class posts. If your students are blogging about things other than their class, you don’t want their other content being fed into the motherblog. 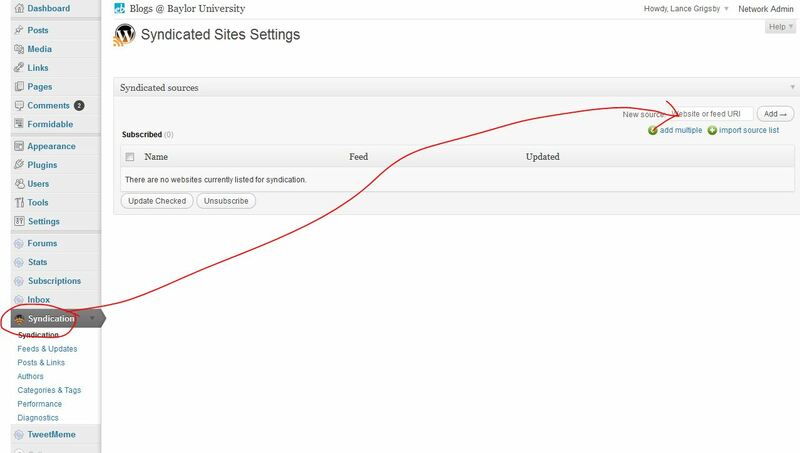 Before you begin, however, it helps to know what the site-naming convention is in Edublogs, and that is: http://blogs.baylor.edu/sitename, where “sitename” is the first and last name of the student as it appears in the student’s email address, minus any underscores or hyphens. So if a student has the email address of john_smith-hines2@baylor.edu, the sitename would be http://blogs.baylor.edu/johnsmithhines2. Also, you will need the feed URLs (web addresses) of that category or tag for each site you’re aggregating. (Alternatively, choose “Posts > Post Tags” instead of “Categories” if you prefer to use tags instead–the process pretty much works the same). NOTE: As they appear in URLs, categories and tags are not case-sensitive; in addition, if the category or tag you’re contains two separate words, it will be hyphenated in the URL. Thus the category “history 1305” would appear as “history-1305” in the feed URL. That should be it. 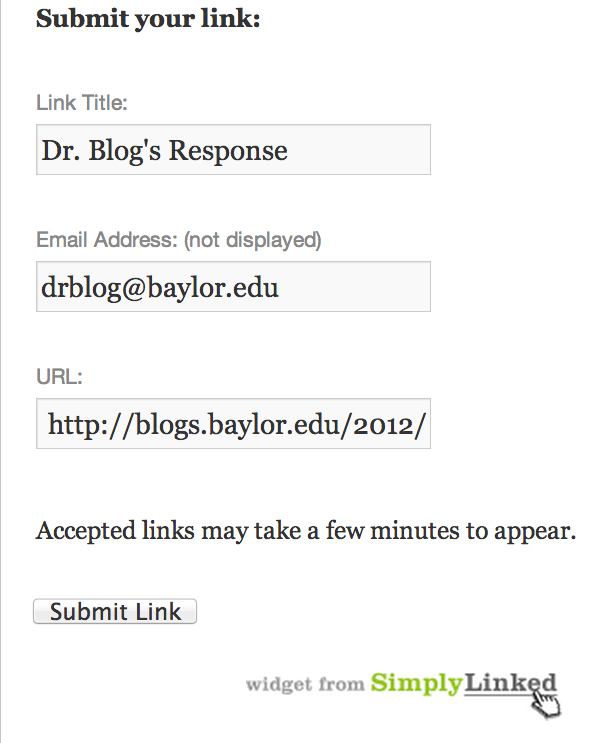 If it’s easier to have your students email their feed URLs to you, I would request that. But at the very least, knowing how feed URLs should be constructed will help you troubleshoot feed problems later on.